As warmer weather moves in, allergy season picks up. Spring brings damp air and the temptation to open windows, a combination that allows mold and mildew spores to accumulate, aggravating allergies. Indoor pollutants increase as dust is stirred by the movement of air through our homes. Allergy sufferers often dread spring as the worst season for symptoms. Unfortunately, the passing of spring doesn’t always bring relief. Summer has its own set of allergy challenges. Even if you’ve never had allergies in the past, it’s possible to develop them at any time of the year. Summertime allergies are sometimes mistaken for a summer cold or even food intolerances. If your sniffling and sneezing is accompanied by dark circles under the eyes, a tired, droopy appearance, a nasal crease (perhaps from rubbing the nose upward in what is known as an “allergic salute,”) or chronic mouth breathing, you may need to see your doctor for diagnosis and treatment. The most common allergens are present year round, and surge in quantity in the spring and summer months. Increased pollen in the air in the spring carries over into summer as new plants bloom and release pollen into the air. Fresh produce is more readily available in the summer. Fresh produce like celery, apples, and melons can cause allergic symptoms due to food pollen syndrome- a reaction caused by allergens found in both pollen and in raw fruits, vegetables and some tree nuts. Not all allergies are related to dust, mold, pollen, and the food we eat. Summer brings with it an increase in the population of flying, biting, stinging insects. Flies and bees are out in force in the summer months, increasing our exposure to them, and the likelihood of stings. An allergic reaction to a sting or bite can range from excessive swelling to anaphylactic shock. If you know you have a sting allergy, be sure to carry an epinephrine injector at all times, especially while working or playing outdoors, and take precautions to avoid stings and bites. 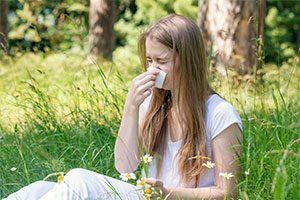 If you or someone you love are suffering from summer allergy symptoms, call Alpha Care for a full evaluation and treatment plan.